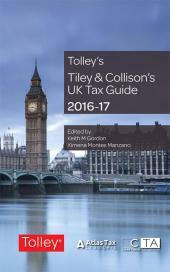 Tiley & Collison's UK Tax Guide 2016-17 offers a thorough examination of the workings of income tax, corporation tax, capital gains tax, inheritance tax, VAT, stamp duty and NIC. This edition has been helpfully updated to incorporate the latest statute and case law up to the date of Royal Assent to the Finance Act 2016. It is fully cross-referenced to major LexisNexis looseleaf works, consolidating your research efforts and bringing you fully up-to-date. click here for more information and details on how to purchase.